This is a Chinese name; the family name is Heng (Chinese: 王; pinyin: Wáng). 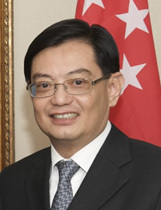 Prior to his election to Parliament, Heng served as the managing director of the Monetary Authority of Singapore (MAS) from 2005 to 2011. In 1983, Heng began his career in the Singapore Police Force where he was awarded the SPF Overseas Scholarship from then President Devan Nair. In 1997, he then joined the Singapore Civil Service's Administrative Service. He served a period at the Ministry of Education, before being appointed the Principal Private Secretary to former Prime Minister Lee Kuan Yew (who was then Senior Minister) in 1997. In 2001, Heng became the Permanent Secretary at the Ministry of Trade and Industry. He then served as managing director of the Monetary Authority of Singapore from 2005 to 2011. In February 2011, Heng was named the Asia-Pacific Central Bank Governor of the Year by the British magazine The Banker. On 18 May 2011, Prime Minister Lee Hsien Loong appointed Heng to the Cabinet as the Minister for Education. Heng was the second first-term MP-elect to be directly promoted to a member of Cabinet, after Richard Hu back in 1984. In August 2012, Heng was tasked to lead a new ministerial committee to conduct a broad-based review of the Government's policies and direction. On 28 September 2015, it was announced that Heng will be the Minister of Finance from 1 October. On 24 April 2018, it was announced that Heng will take over responsibility for assisting the Prime Minister on National Research Foundation matters from Deputy Prime Minister Teo Chee Hean effectively from 1 May. On 19 February 2018, Heng announced on his annual budget statement in parliament that he plans to raise GST from 7% to 9% some time between 2021 and 2025. He said, "the GST increase is necessary because even after exploring various options to manage our future expenditures through prudent spending, saving and borrowing for infrastructure, there is still a gap". On March 28, Mr Heng has drawn flak for mentioning that "Singapore's older generation pionners are not ready for a 'non-Chinese' PM". This matter remains controversial as Madam President Halimah Yacob was recently selected as the Singaporean president two years prior. Heng is married to Chang Hwee Nee, CEO of the National Heritage Board. Heng has 2 children. On 12 May 2016, Heng Swee Keat collapsed from a stroke during a Cabinet meeting. He was taken to Tan Tock Seng Hospital, where he underwent neurosurgery to relieve pressure in his brain. He was transferred to the ICU after the surgery. Deputy Prime Minister Tharman Shanmugaratnam, was immediately appointed to cover Mr Heng's duties. On 25 June 2016, Heng Swee Keat was discharged from hospital after 6 weeks. The Prime Minister's Office said on a statement that Mr Heng "has made an excellent recovery", but is still on medical leave as he continues his rehabilitation. He resumed his duties as MP and Finance Minister on 22 August 2016. Despite his stroke, Heng is seen as a leading contender to be the next Prime Minister of Singapore. In 1983, Heng graduated with a Bachelor of Arts (Honours) degree in Economics from Christ's College, Cambridge. Heng holds a Master of Arts in economics from the University of Cambridge. In 1993, Heng obtained a Master of Public Administration from the John F. Kennedy School of Government at Harvard University. He completed his pre-university education at Raffles Institution. ^ hermes (2018-11-24). "Heng Swee Keat picked as 4G leader, with Chan Chun Sing as deputy". The Straits Times. Retrieved 2019-01-18. ^ Nurhidayah (28 September 2015). "Transcript of Prime Minister Lee Hsien Loong&#039;s Statement at the Press Conference on the new Cabinet Line-Up on 28 September 2015". Prime Minister‘s Office Singapore. ^ Anthony_chia (24 April 2018). "Changes to Cabinet and Other Appointments (Apr 2018)". Prime Minister‘s Office Singapore. ^ "Heng Swee Keat to be PAP 1st assistant secretary-general, and next PM: Party sources". TODAYOnline. 22 November 2018. ^ "PAP's new CEC". PAP.org.sg. 23 November 2018. ^ "Heng Swee Keat picked as PAP's first assistant secretary-general, indicating he will be next PM". StraitsTimes. 23 November 2018. ^ AW, CHENG WEI (2015-03-02). "Two former First Ladies attend Girl Guides event". The Straits Times. Retrieved 27 July 2017. ^ "Chang Hwee Nee appointed National Heritage Board CEO". 2017-03-20. Retrieved 27 July 2017. ^ "Heng Swee Keat: I protested when I was moved". Retrieved 6 August 2017. ^ "Heng Swee Keat out of surgery; in ICU after stroke". Channel NewsAsia. Retrieved 13 May 2016. ^ "Heng Swee Keat in stable condition: PM Lee". Channel NewsAsia. 13 May 2016. Retrieved 13 May 2016. ^ hermesauto (2018-01-26). "Singapore's 4G leaders need more time to gain exposure and experience: Analysts". The Straits Times. Retrieved 2018-01-28. Wikimedia Commons has media related to Heng Swee Keat. This page was last edited on 12 April 2019, at 16:59 (UTC).